A Wireless Solution for High Density Temperature Measurement Applications Many users across the process industry need to monitor hundreds to thousands of temperature measurements in a plant to ensure efficient operations. The 848T Wireless monitors up to four independently configurable RTD, thermocouple, ohm, millivolt and 4 â€“ 20 mA inputs allowing users access to more temperature measurements without any signal wire. Increased visibility to plant operations allows for proactive maintenance and monitoring of key assets such as motor bearings that drive pumps, fans and compressors, as well as heat exchangers, tanks, reactors and boilers. Fully compatible with any WirelessHART network, the Rosemount 848T Wireless provides the same rich diagnostic data and reliable performance as other devices in the Smart Wireless family. It monitors many temperature measurements with one device ensuring accurate and stable measurements and continuously monitors measurement integrity. 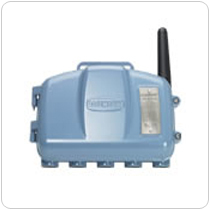 The device is self-powered and utilizes SmartPower to provide an intrinsically safe power module with long battery life.